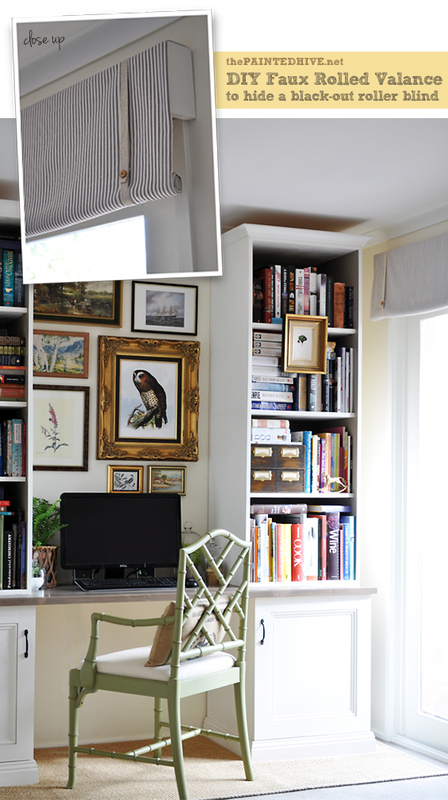 As promised, here is the reveal of my transformed home office space! It’s nothing spectacular, and there’ll probably be some future tweaking, though for now I’m calling it done! Oh, and if you missed the awards ceremony, don’t worry, you can congratulate me later. Huh, what’s that? You didn’t hear? Well, I broke the world record for “Longest Running Room Makeover In History”. I got a pretty big trophy. 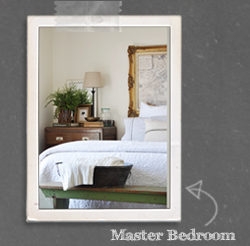 Yep, I managed to make this simple little room redo extend for well over 365 days! It has now officially been more than a year since the first of my ‘home office‘ posts. Phew! Anyhoo, let’s get on with it. 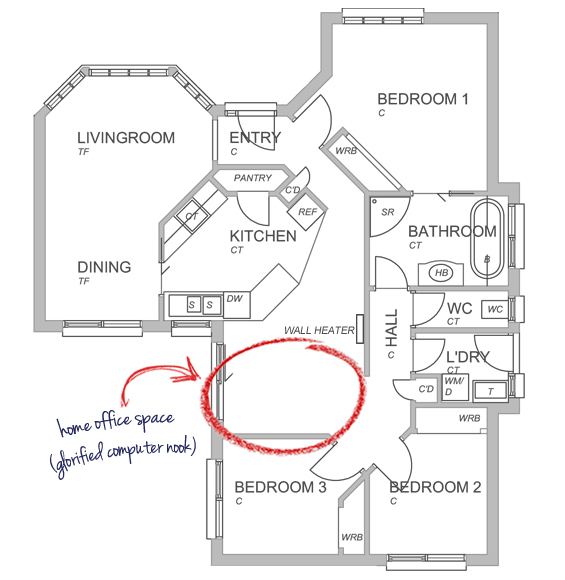 I’ll briefly outline some of the design decisions in this post though if you wanna better understand the thought-process behind the room you can catch-up on my previous home office posts here. Above is the space in its prior ‘make-do’ state…argh, cringe! To make way for the new room redo I sold the bookcases and cupboard on eBay and relocated the jute rug to our entryway. Given we don’t have a spare room to act as a proper home office (with space for filing trays, paper piles and other office-y stuff), I simply wanted to create a pretty yet practical computer station (yep, we have a big, bulky, stationary PC in favour of a neat, little, portable laptop) which didn’t interrupt the homey flow of our house. It also needed to hold all our books and hide the ugly technological thingamabobs. 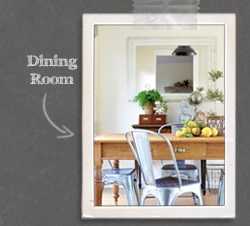 Please excuse the corner of my kitchen bench – it’s a tricky space to capture. 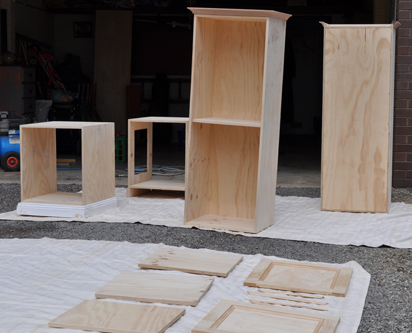 I mentioned in some previous posts my dilemma with finding affordable, appropriately proportioned cabinets (I scoured eBay for months and IKEA’s selection just wasn’t quite right). In the end we were fortunate to have an awesome friend of ours custom build the cabinetry at mate’s rates (‘course you could DIY something similar though, or get innovative with second-hand or shop-bought cabinets if you don’t have finicky size and storage restrictions). It’s completely free-standing and modular, with the desk, two upper bookcases and two lower cabinets forming five separate pieces, so it is easy to relocate and even reconfigure if needed. You can read more about it in this original post. I finished it with an acrylic low sheen in ‘Antique White USA’ (by Dulux) which I sprayed on using a compressor and air gun. The desk, which is simply a pre-fabricated solid pine panel, I finished with an acrylic all-in-one stain and varnish in ‘Marita Grey’ (by Cabots). 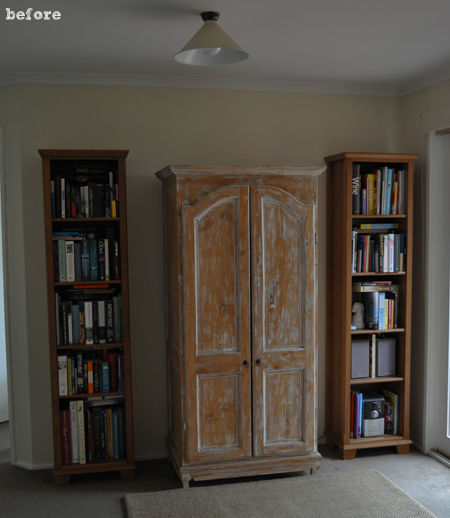 Though it’s hard to see in the photos, I also painted the inside of the bookcases in a warm grey (I mixed up the colour myself from left-overs I already had). I thought a wall of floor to ceiling cabinets might feel imposing and cumbersome in our little room though the tall, slender cases and long spanning desk actually help create an illusion of height and space. I know it’s trendy right now to display lots of ornamental knick-knacks on bookshelves though I thought I’d be a bit different and use my bookshelves to hold, well…books. The cases are double-depth to allow for extra storage (so, if need be, some of the books we’ve already read can be housed at the rear) and the shelves are repositionable. 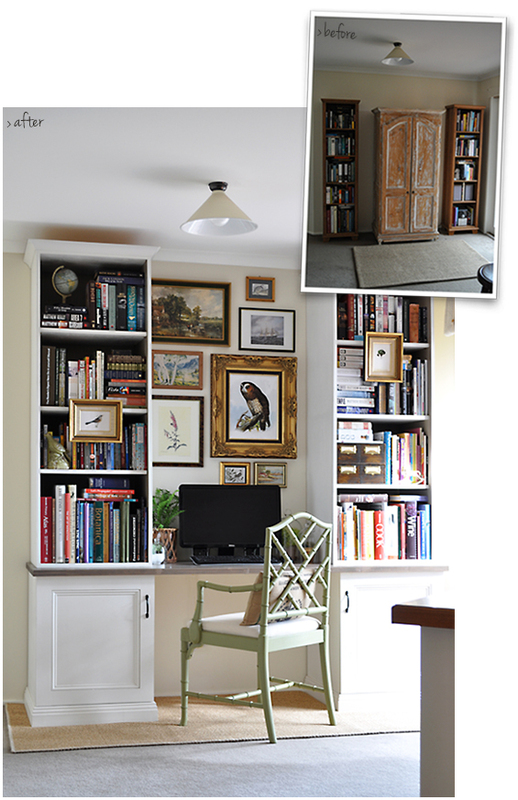 I know to some people a mish-mash of books can look messy and distracting though I think their jumbled layers are warm and personable, and lend a real collected sense of ‘home’ to a space. My hacked IKEA drawers (which I now have two of!) grace one shelf. They are prefect for keeping practical little stationery items within arms reach (and apparently they are also ideal for safely stowing away my husband’s prized hole-in-one golf ball!). The power point is located behind the right lower cabinet which holds the computer tower and all associated components (like the modem, sound system and external hard drive). It has a mesh side to allow for extra air flow (this is something I probably wouldn’t have bothered with though hubby insisted on – it looks completely fine though is concealed beside the wall anyways). 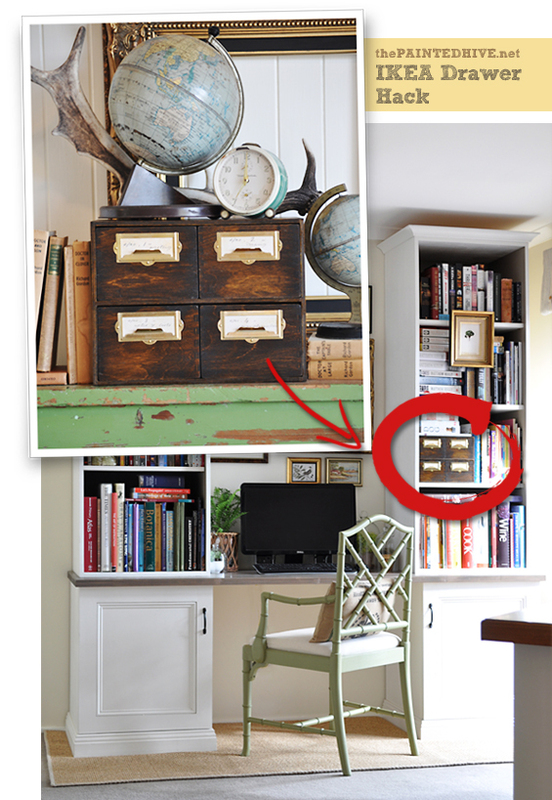 The lower left cabinet holds the printer along with some stationery bits and bobs and CD’s. 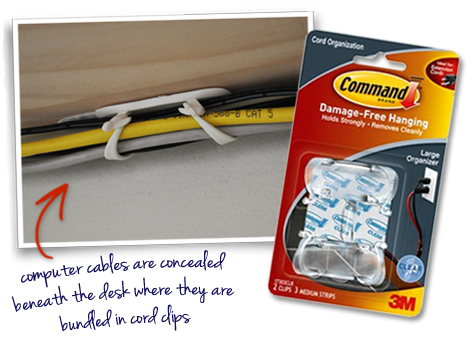 All of the cables are discreetly concealed on the underside of the desk where they are neatly bundled in adhesive cord clips. The rug is from Floorspace. It needed to be a pretty specific size and unfortunately I couldn’t find anything ‘off-the-shelf’. 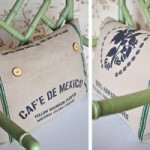 I considered DIY’ing something though really wanted a heavy jute to add some natural texture and warmth. To save on the usually extravagant cost of buying something bespoke I arranged to have it custom-made from an old off-cut. Although it was anchored by two heavy cabinets the rug still shifted and bunched-up like crazy on the carpet so I came up with a slightly weird solution which you can read about in this previous post. The wall gallery is deliberately eclectic. 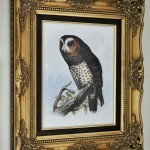 It is made up of inexpensive thrifted frames, some with their original art and others with free images I found online and had cheaply printed (you can read about the owl print here). I like the way the unstructured collection of frames mimics the busyness of the flanking bookshelves, giving a sense of continuity to the wall as a whole. To further enhance this sense of cohesion, I also hung two pictures on the bookshelves themselves. They are attached with simple picture strips so they are easy to remove and replace if needed. This is a look I love though I’m pretty sure it completely broke my husband’s brain (bamboozled doesn’t even begin to describe his level of incomprehension! I actually had to jump on Pinterest and show him some other examples just to prove my sanity. Though, in his defence, I do get why he thought I was crazy – hanging pictures in front of books is a slightly weird concept). I also like that the collage of pictures helps camouflage the computer monitor. The big windowed sliding door (which is hard to see in the photos) is dressed with a DIY rolled valance which hides a practical black-out roller shade (which we need to block the frequent afternoon sun and occasional penetrating cold). You can read all about it in this previous post. 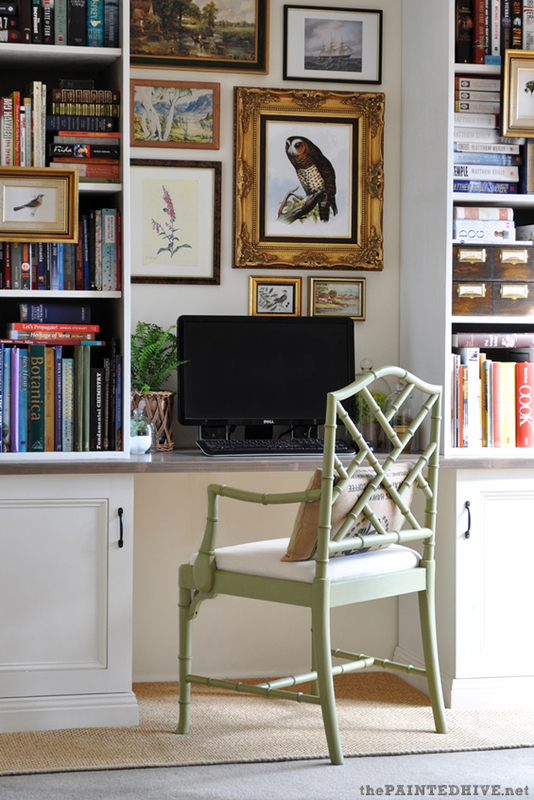 After having used an antique timber kitchen chair at our computer for years the Chippendale carver is like heaven! I’d love a fully upholstered tufted chair (or similar) one day though whilst the kids still have chronic grubby finger disease, I’m sticking with something that’s easy to re-cover if needed. The soft green looks more vivid in person, though is still subtle – I didn’t want a pop that punched you in the face though in the future I might amp it up a bit! 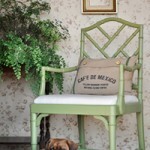 As blogged about previously, I bought the Chippendale chair as a raw, un-upholstered frame and finished it off myself. 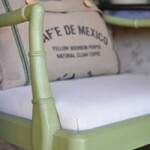 See my tutorial for upholstering the drop-in seat here. 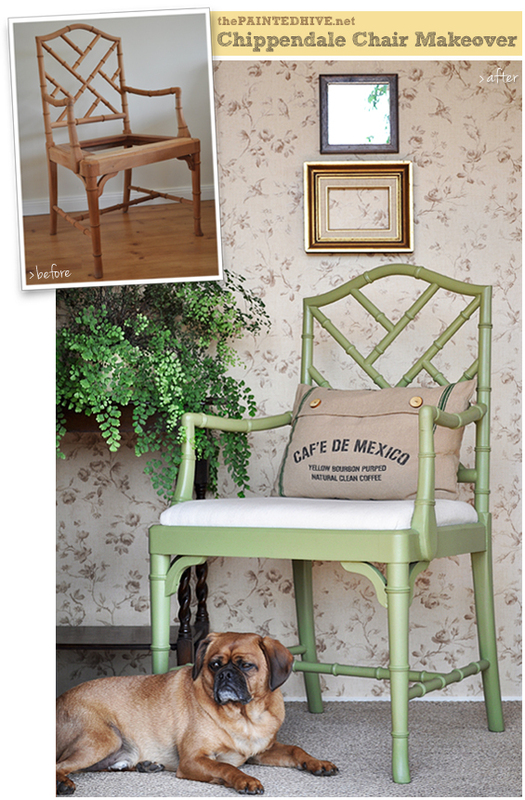 Read about the the chair makeover in general here. 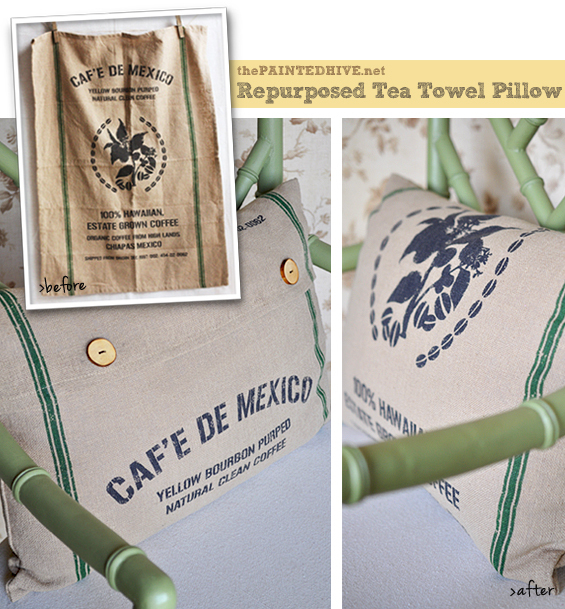 The typographic pillow is a repurposed tea towel. You can read my simple tutorial in this previous post. Whilst the ceiling light is central to the room it is not in alignment with the cabinets. In person, when you view the room as a whole, this looks completely fine though in the photos where the focus is on the cabinets it does seem to throw off their symmetry. Regardless, we almost never use that light anyways as the adjoining kitchen down-lights provide ample brightness, so one day I might remove it completely in favour of some subtle integrated cabinet lamps. We have pretty low ceilings and the light is directly above a walk-through so sadly there is no vertical space for a lovely hanging feature pendant. For now I’m happy to stick with the simple enamel shade. Like I said, nothing spectacular though pretty (enough) and practical. Have a fab week everyone. UPDATE: This is mentioned in the body of the post though I also wanted to highlight it here due to the amount of interest it has generated…. 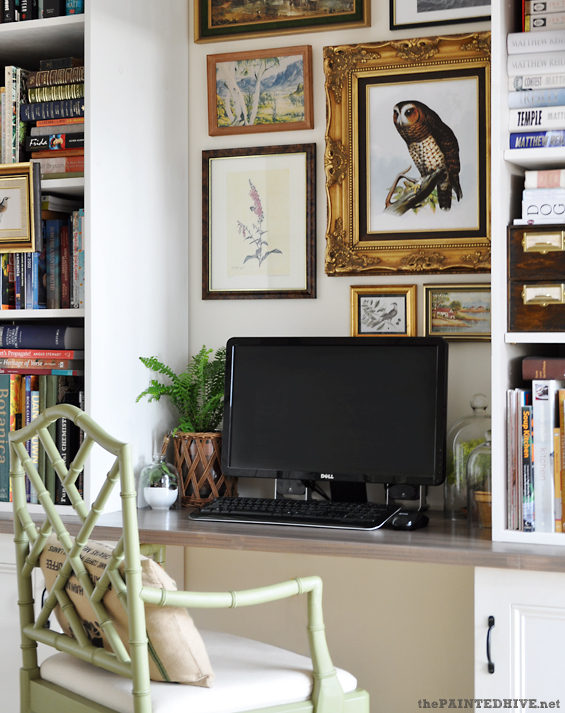 One of the most loved elements in my home office space appears to be the owl print. I agree, it is pretty awesome! Good news is, it’s not a one-off original oil painting I salvaged from some dingy old antique store. It is a free printable! Soooo, if you’re truly crushin’ on it, visit my original post about it here for the download link, and get one up on your own wall – yay! When you said you were going to be back with a new post, boy, you really meant it! This is exactly the kind of set up I need in our den/rumpus. We have a great big computer too and I have been struggling for ideas how best to incorporate it. All of your little details are so perfect. I love that you didn’t build in the cabinets so you can move them if you want to. Lovely, lovely, lovely! Treagan, you are always too, too sweet! Thanks so much. Oh, I have been waiting (and waiting) to see your office space and I’m not disappointed. It’s full of gorgeousness. Love the gallery and all the books. So homey. The look you have created here is like what I see in magazines and pine for though figure is too ‘designery’ for us regular people. Well, you have made it real and do-able – THANK YOU so much. I really appreciate your hints and explanations for how to achieve it on a budget and in a practical way. What a stunning space! A dream to work in!! All the little details make it perfect. I just love the way you did the shelves and above the computer…very professional looking! Thanks so much Melaine. 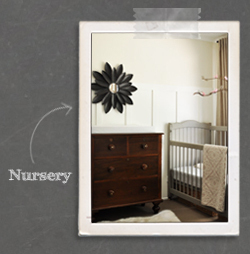 Don’t think you need to rearrange anything though…love your home. Looks fantastic. The art is crazy awesome and the staging perfection. I LOVE it!!!! 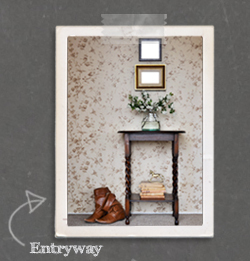 I love the gallery wall, the built-ins, the styling, especially the pictures in front of books! 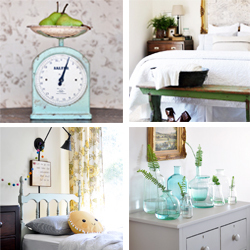 You do such an amazing job on your blog….I always feel like I’m reading one of my decor magazines…I love the inset pics of objects that I might have overlooked. It takes me a bit more time though I really enjoy putting my posts together in a ‘magazine-y’ way (well, as best I can manage, anyways). Good gawd woman, you are good. What a beautiful little space. it’s perfectly you- love it! and i want to steal your chair. you are lucky i am not on your continent, sista! (First-time commenter) Love the redo! 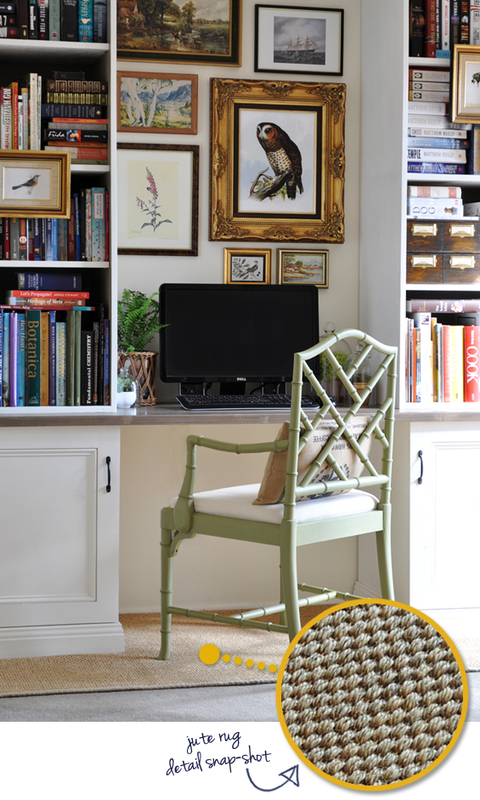 The eye is drawn to the two beautiful cabinets, your lovely green chair, and the owl picture. Nicely done! Gives me the motivation to do something about the blah spaces of my home; not just ignore them because it’s easier. 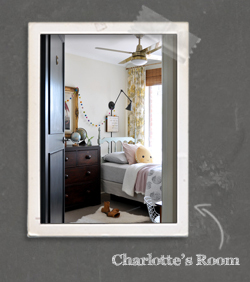 I still have a few ‘make do’ rooms I’m yet to find the motivation for…it’ll happen…one day! It looks beautiful and proves that some things are worth the wait. I, too have been working on re-doing my dining room and it’s been in process for at least 8 months! And it’s a small, small room! Anyway love the job you did on the gallery pictures above the desk and LOVE that chair! The space is wonderful. Kristine, This was WELL worth the wait! I absolutely love it! 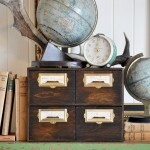 So sad I can’t get those cute Ikea drawers in the US – will have to try Hobby Lobby for a good substitute! 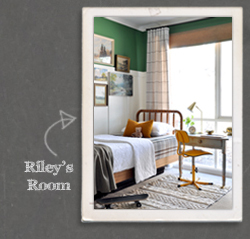 The whole space is just lovely- thank you for sharing all your ideas and your lovely home! Oh My Goodness, Kristine….this was suppose to read * Perfect Symmetry -not cemetry. . I should never let my computer edit my words, then not check them. so sorry. He, he. Don’t worry Judith. I knew exactly what you meant and I assumed it was just one of those auto computer spell-check typos. Thanks so much for your lovely comment, as always. I love what you have done with the space! I love how you’ve mixed a traditional look with a modern twist. 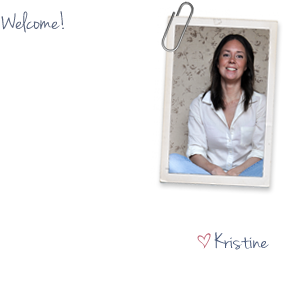 I abolsutely love your before & afters! amazing little space that you have carved out for yourself! You are a great writer. Thank you for your detailed description of your project. It looks beautiful and will be easy for someone to take up a similar project from your ideas. Love your work and words! Nothing spectacular? I beg to differ! It is so chic! I think it is amazing! Thanks Lizzie. I’m so glad to hear you find the books refreshing. I almost felt pressured to display décor accents instead (even though we have no-where else to house our books) though am super glad I stuck with the books…they are personable and homey. Kristine, just beautiful. It is a pleasure to look at pieces of old and new given a place that makes them all sit together with equal importance, balance and care. That old saying you don’t have to have a lot of goods in your home, just have the things you love. Cleaning your home then is not just cleaning, but treasuring what you have. You almost revived me out of my winter blues. Four days in a row with no sun and just enough sleet to keep the kids indoors good old Canberra winters can really mess with my enthusiasm. Over half way through Winter now so hopefully we start seeing some motivating sunshine! Love the way you’ve styled this, keeping traditional pieces feel while giving the space a much more contemporary and eclectic feel. Great job! I love that owl too Andie. He has such a beautiful presence and really makes the space. This is beautiful! I love your style! That gallery wall is so fun. I popped over from HoH–thanks for sharing! Hi Kristine this looks fabulous. I love the books on display. I too have a stationary pc I prefer it my hubby has a laptop but it’s harder to use. Thanks for the explanation as to where every thing is you answered all my questions. look forward to your posts. I prefer a stationary PC too Karen. I love having a keyboard and a mouse and a great big monitor! So easy to work at, especially when editing photos and designing graphics. I think it is totally spectacular, and I’m thrilled to see you put books on the bookshelves. :) We have a stationary PC, too, and I love it’s huge screen. Thanks so much for sharing! You are seriously too sweet! Great job Kristine! I LOVE all the little elements that went into this project! Little things like the drawers, the cord clips, and the rolled valance. Thank you for posting this! First of all you did a FABULOUS job, secondly it helps give me ideas for a similar space in our “new” home! Beautiful, Kristine! 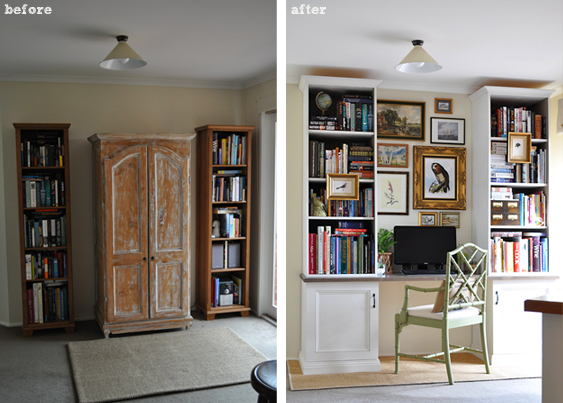 Love everything about this makeover! 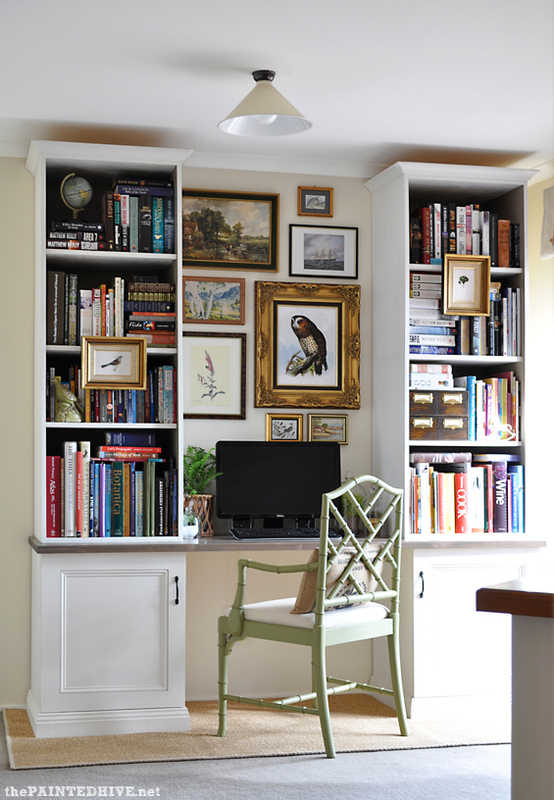 Love the bookcases and the pictures you hung over the desk area. It looks so neat! It looks like you managed to achieve what you were going for here. I bought a second set of IKEA drawers and, like yours, mine are still sitting somewhere un-loved too – oh well, like you said, there are other priorities and projects can wait. Hope you have a lovely week ahead. Thanks so much for stopping by. I love EVERYTHING about this space! And indeed your entire home. What a talent and inspiration. Mother/wife/designer/decorator/blogger. AMAZING. Wow, this is quite inspiring! Very lovely. Just perfect mix of clean modern lines with classic vintage and pops of color. Pinning this for inspiration. Thank you for sharing! Wonderful makeover! I love the maximalist look you have going on your shelves. It can be tricky to pull off, but you have succeeded! Everything just flows together so nicely! Love that owl print too. 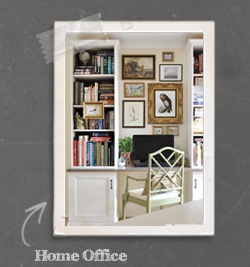 Your transformed home office space is looking fabulous and very stylish too! Tremendous work is done with this makeover. I really appreciate this, loved it! 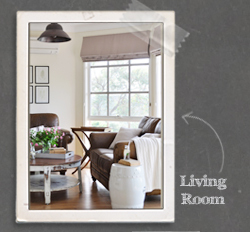 Beautiful and homey and comfortable-looking and so well thought out. Thank you for going into such detail. So many inspiring ideas (really love the books and the owl)! Congratulations Kristine! Btw, your new home office looks nicer… I like the thought that you always included the before photos so we can spot the big difference. Looking forward to another room transformation hehe. Clap! Clap! This looks great and those shelves look AMAZING! I just posted our shared office reveal on my blog. I still need to find some great “knick knacks” to finish styling my shelves. I’m not sure my floating shelves can support the weight of too many books and considering that our desks are glass…Anyhow, I digress. LOL. Excellent job love the look! I love this makeover! It’s so smart — what a great use of a wall and a great combination of hidden storage & open storage. Love the eclectic collection of art too. The rug is a great idea as well, further making that space as its own! Congratulations! This is so fabulous and stylish, a real inspiration. I’m truly impressed and appreciate the detailed explanation of how you approached this project. Very pleased to have found your website. Hey, I am waiting that some one can change my home look like this. It is so fantastic.. 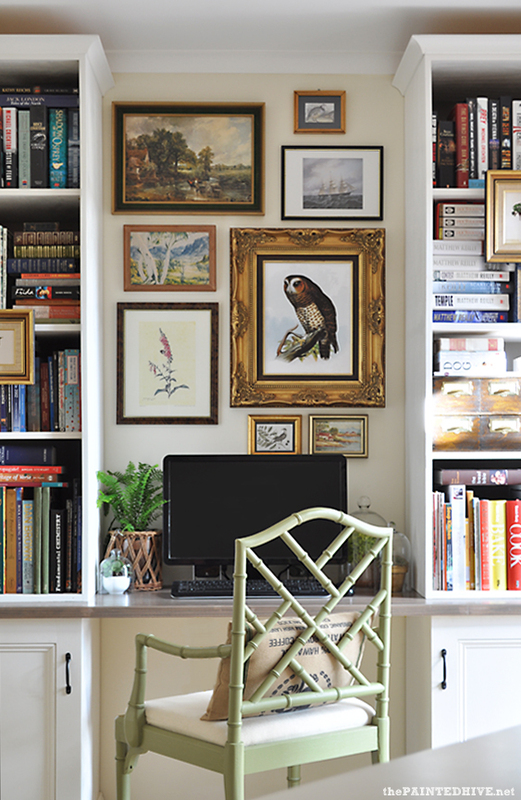 I absolutely love your home office makeover! The tall white bookshelves and gallery wall in the center really makes this a special space. All the small little details are absolutely perfect as well. Great job on this project! I couldn’t agree more on trying to hide the “ugly technological thingamabobs”. 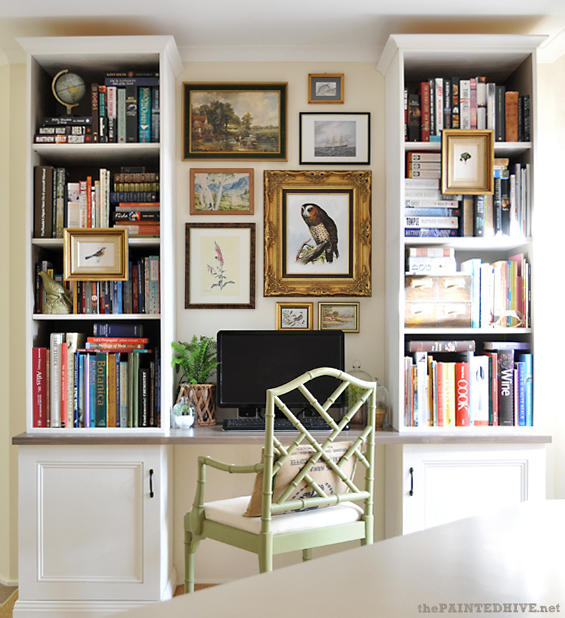 If you do a search for home office, walk-in closet, gift-wrap station, butler’s pantry, laundry closet, mudroom, or anything of that nature, then images and ideas abound. Search hide electronic components, and good luck getting anything useful back. It’s as if Designers have forgotten that we have modems, cable TV boxes, and assorted other wired and necessary components that don’t necessarily look pretty next to the sleek Flat Screen TV and ultra-modern fireplace, or your tidy bill-paying station. H-E-L-L-O, someone needs to start paying attention to this decorating issue. It is not important on a grand world scale of cure disease, end hunger and stop wars, but it’s useful info that is currently missing from the ‘beautifully organized homes’ hype. Thanks so much Ana. And it’s never too late to comment on a blog post – I love getting belated ‘surprise’ comments! I know what you mean about the lack of designer articles which elude to incorporating technological components, appliances and cables. It is almost like most designers have forgotten about their inevitable inclusion in our homes. I find bloggers are more open, honest and realistic in relation to addressing this decorating dilemma, and every now and again I do stumble across a blog post which talks about this issue. Perhaps it’s something I should consider writing about too. I was wondering what the actual table top is? Is it painted wood? It is hard to tell and I love it! As briefly mentioned in the post, the top is simply a pre-fabricated solid pine panel (which just happened to be the perfect size!). I finished it with an all-in-one stain and varnish (Cabots in Marita Grey).